Welcome to the Cocktail Heatmap, a guide to the hottest drinking dens of the moment across New York City. For Eater’s guide to New York’s top cocktail bars (both old and new), check out this list. Right above Hudson Yards’ Legacy Records, the Charlie Bird/Pasquale Jones crew have Ada’s Place, with $18 to $95 cocktails by P.D.T. maestro Jeff Bell. Drinks will rotate seasonally, and right now the list is divided between signatures, like Toki-O (Toki whisky, sake, Drambuie, Angostura bitters, koji), and reserve drinks that incorporate spendy spirits like Yamazaki 12 and Talisker 18, plus Krug Champagne. Also expect European wine sophisticated bar bites. A star new bartender team has taken over Gibson + Luce, the bar inside the Life Hotel. Pam Wiznitzer, of Seamstress fame, is back at chef JJ Johnson’s African reboot of Midtown restaurant Henry, and she’s brought Eater Young Gun bartender Dorothy Elizabeth with her. The downstairs bar, still called Gibson + Luce, is Wiznitzer’s domain, as is the drink menu upstairs, both of which pull in flavors from the African diaspora in the drinks. The Whirlwind, for example, blends scotch, peanut, blueberry, sorrel, lemon, and egg white, while the Wait Wait is made with bourbon, plantain, lemon, ginger, and bitters. Within a plush Ken Fulk-designed space that strays from the traditional austere sushi bar aesthetic, chef Shigeyuki Tsunoda serves a $285 (tip included) Edomae-inspired omakase highlighting pristine fish, much of which is flown over from Japan. 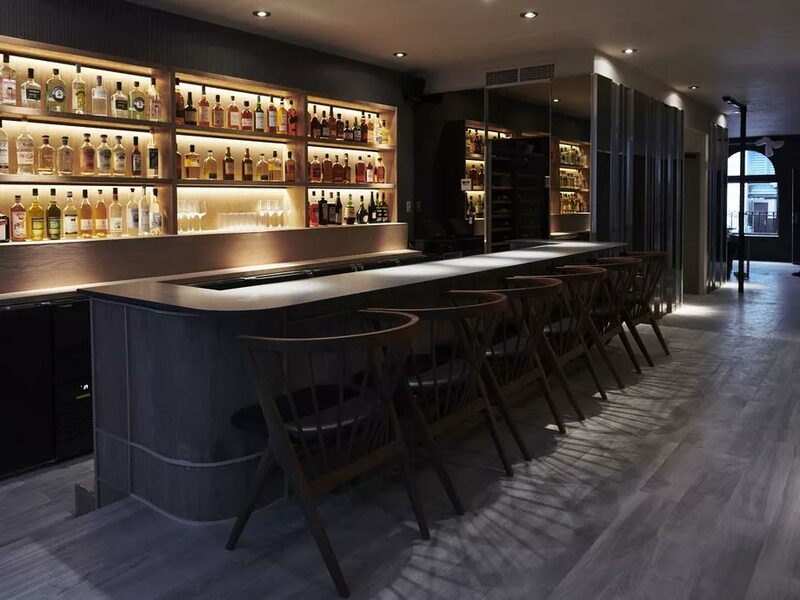 Initially only open to diners, the cocktail bar up front now serves the public Japanese whisky and seasonal cocktails devised by EN Japanese bartender Nick Krens and Bar Goto’s Kenta Goto. Options include the Breeze (tequila, jasmine-infused sake, watermelong juice, wasabi, wintermelon bitters, mint ice cube) and the Shade (aged rum, sugarcane shochu, pineapple juice, lemon, vanilla). At $22, though, they don’t come cheap. Atomix is the ambitious, minimalist modern Korean tasting menu engagement from Atoboy’s Junghyun and Ellia Park. 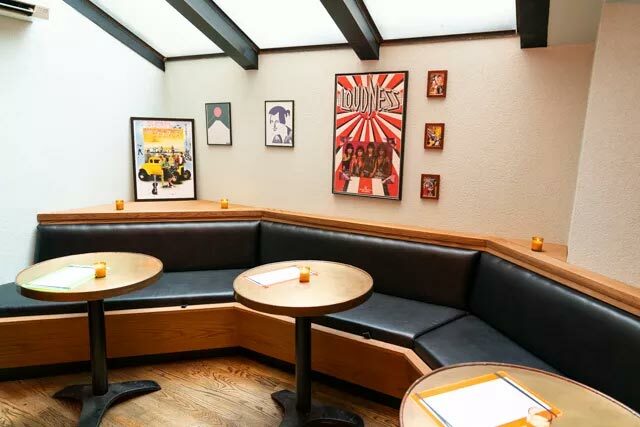 But upstairs, the five-seat cocktail bar and lounge area is the territory of Jesse Vida (BlackTail) and Samantha Casuga (Dead Rabbit). There, Asian ingredient-flavored drinks and several soju-laced numbers, like Iron Age (vodka, Combier, yuzu, lime, soda), and Heaven’s Son (rye, soju, Cocchi Torino, dry Curaçao), are on offer, alongside a la carte fare. People can walk right in there, with tasting menu plans or not. Stay Gold lands in the unlikely locale of Kips Bay, bringing quality drinks and a relaxed vibe to a generally underserved cocktail hood. Matt Piacentini and Chaim Dauermannof the West Village’s lauded the Up & Up are behind the place, and they’re hoping to establish an approachable neighborhood fixture. In addition to a few classics from the Up & Up, head bartender Kacie Lambert is mixing and muddling accessible yet inspired drinks, like Zuzu’s Petals (tequila or mezcal plus ginger, habanero pepper, rose, lime) and Bye Birdy (vodka, strawberry-basil tinctures, lemon, seltzer). Pro tip: look out for Stay Cold, Stay Gold’s frozen bourbon-beer slushies. Japanese cocktail bars are all the rage, and next up for New York comes Katana Kitten. Helmed by former Saxon + Parole barman Masahiro Urushido, along with Cocktail Kingdom’s Greg Boehm and Boilermaker’s James Tune, the izakaya-inspired drinking den fuses Japanese and American tastes, offering five highballs (including a shisho gin and tonic riff), five twisted classics (think yuzu-shio daiquiri), and five boilermakers (Sapporo Black Label + negroni). Japanese street food-style bites accompany the boozy offerings. The bi-level space offers two different moods: Upstairs is a more casual situation, while the basement can get a little more rowdy. Science-y cocktail guy Dave Arnold of the East Village’s shuttered Booker & Dax is back, this time in Greenwich Village with hotly anticipated Existing Conditions. PDT alum Don Lee and Cocktail Kingdom’s Greg Boehm join in, and together the trio is proffering globally flavored, technique-driven drinks, both classic and new. In addition to vending machine-dispensed bottled cocktails (such as butter- and popcorn-infused rum and Coke), one will find drinks like Strawberry Carborita (tequila, clarified strawberry, clarified orange, clarified lime), and Edessa (rye, urfa biber-infused East India sherry, Bénédictine). There’s also snacky bar food (crispy shrimp sticks, latkes with steak) from Jean-Georges alum Josh Eden. The leaders of lauded East Village bitters bar Amor y Amargo, Max Green and Sother Teague, have debuted a tiny tea-tinged cocktail destination within Middle Eastern restaurant Local 92. Blue Quarter’s nine cocktails run $15 and most incorporate tea. For example, Unfinished Story melds matcha with tequila, coconut, and lime oil, while Dragoon Punch blends black tea with lemon, rum, and brandy. Boutique London hotel export the Hoxton has finally thrown open its Williamsburg doors, equipped with three food and beverage options from industry vets. Now that the weather is chillier, the one to choose is Klein’s, the ground floor all-day restaurant with a big wraparound bar. Cocktails from beverage manager Chad Dutkowski include Pillow Talk (bourbon, falernum, plum bitters, chocolate mint, lemon) and Le Botin Old Fashioned (tequila, smoked mesquite agave, orange and turmeric tincture). 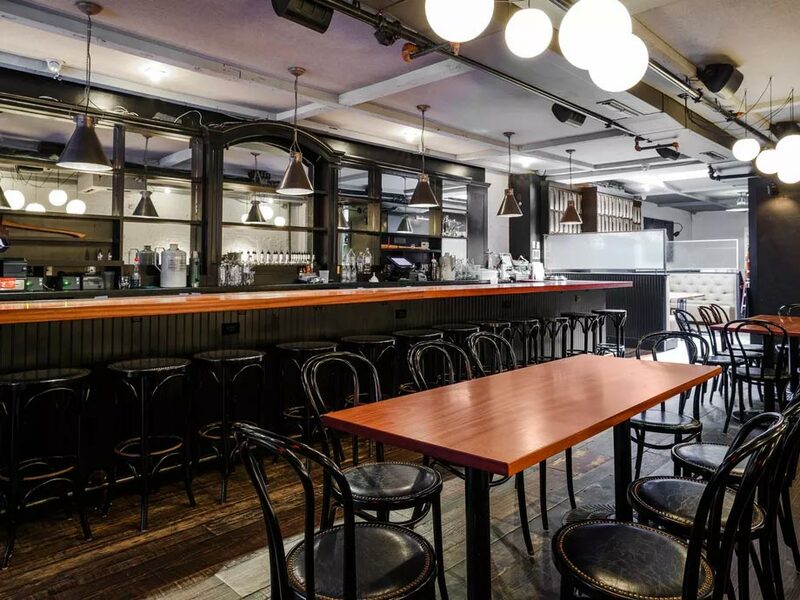 Also from Blue Quarter’s Max Green and Sother Teague — now mini-empire builders — is Windmill, a French-focused bar on the Lower East Side. In drinks, French ingredients like cognac, calvados, and chartreuse are the focus, such as in the Clinton Street Sour with cognac, Campari, lemon, pineapple, and bitters or the Bad Apple with calvados, mezcal, benedictine, montenegro, and rose vermouth. Food comes from the team behind Le French Diner and includes skewers and French bites like seared foie gras. It’s a tiny space with just 18 seats, though outfitted with rails and tall tables for standing and mingling. This third location of cocktail bar the Garret, from the team behind the Lately, focuses on ingredients and liquors from Latin America and the Caribbean, with tequilas and mezcals a main attraction. Like the East and West Villages locations, this one brings crowded Friday and Saturday nights in a handsome room filled with Cuban art and quirky props. But the energy is high and drinks such as the South of Stress (tequila, soursop, pineapple, lime, coriander, mole) are well-executed. For those in need of some food, tacos do the trick. The Elk cafe’s Claire Chan has expanded from the West Village to Williamsburg with Bar Beau, a pretty all-day cafe and cocktail bar cupping Parlor Coffee by day, and shaking classic and drinks that lean heavier on Japanese ingredients by night. Den Hospitality’s Grant Wheeler is responsible for those drinks, such as the Tonka Truck (gin, aquavit, lemon, turmeric, yogurt, egg white, rhubarb) and the Velveteen Rabbit (brandy, rum, black sesame, miso honey, cream). Former Lalito chef Gemma Kamin-Korn is commanding matching bar bites like yuzu koshi-spiked deviled eggs and shiso pesto udon. Eater critic Ryan Sutton says the best way to experience Danny Meyer’s new sky-high venue is at the bar. Head sixty floors up for standard-issue cocktails such as a take on a Manhattan — minus the “n,” like in the name — with rye, sweet vermouth, demerara, and bitters. Drinks are $18, but they include service, and the view is well worth the difference. The entire three-course, prix fixe menu is available, as are snacks such as croque madame and chicken nuggets.